Barrel of the Bottoms is an eclectic and professional space for artists looking to master their craft in the radio, film, and comedy scenes. We believe that talented individuals in Kansas City need a home to network and a platform to promote content. Have an idea for a podcast? Need to record sound clips for your acting portfolio? Our soundproofed recording studio is ready to broadcast high-fidelity content for your listening pleasure. Studio time can be rented by the hour, but our membership offers unlimited access to our facilities and showcases your work through the growing Barrel network. We now offer trial memberships, so contact us to book your first recording completely free! Barrel of the Bottoms hosts monthly comedy showcases, open mics, and other events to bring Kansas City's burgeoning talent under one roof. If you're a stand up comic, musician, or poet, we wants to give you a platform to succeed within your creative community whilst building a new network in the process. Each month, we choose one member for our community spotlight to show off their recent accomplishments and promote any upcoming shows or content they want to share. 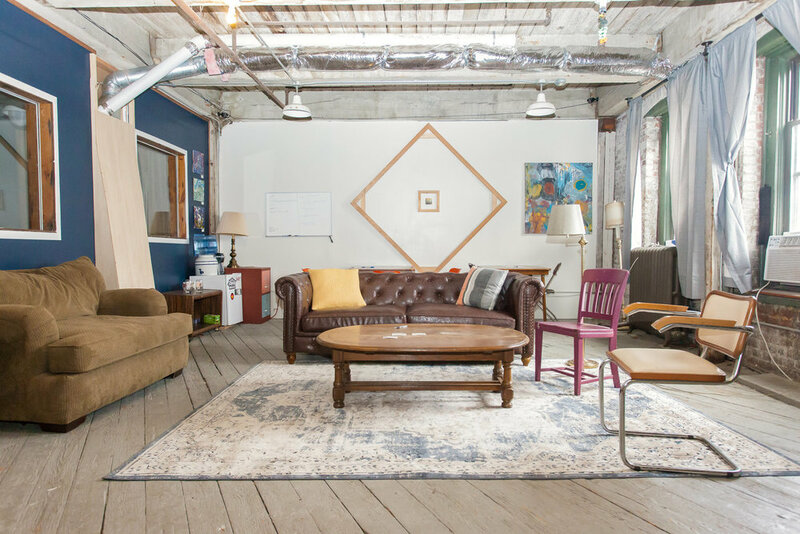 Our office space in the historic Hobbs Building of the West Bottoms provides the comfort and high-speed internet access that great ideas can thrive in. Whether you need a distraction-free writing zone or somewhere to brainstorm with your fellow content creators, we want to incubate the diverse creativity that the city has to offer. We host weekly writing workshops for those wanting to fine-tune stand up jokes, sketches, and scripts. Complimentary coffee, water, and beer is provided to all members! Here's what's going on in the BOTB community. There's one thing we know fans of comedy will be doing on 4/20: laughing. If you're looking for somewhere to do that, the Barrel is hosting TWO amazing acts, Panic! and comedian Kris Pierce. Panic! hosted by James Doyle and Dante Powell is a stand up comedy show bringing you the highs and lows of comedy as they project random topics and ideas onto a screen for performers to make up material about on the spot. Our headliner, Kris Pierce has quickly cemented himself as a powerfully unique voice in the American comedy community. When not opening for the likes of Kyle Kinane, Sam Tallent, and Sean Patton, Kris has managed to make his hometown of Little Rock, Arkansas a comedy destination by sheer force of will. The boys in the Adic love sports, brackets, and love getting drunk on Saturday mornings. Conversations include baseball, football, beer, and welcoming all opinions. Any opinion can be a fantastic opinion, as long as they have a good reason. Nic, Adam, and Chris put out new episode every Sunday on iTunes and SoundCloud.